After a number of birding walks on Cape Cod, Craig became fascinated with the local Ospreys. They became easier to identify and he found many Osprey nest locations nearby. The nests were easy to access for viewing and provided ample opportunity for behavioral study. The Osprey activities fueled his passion for watching and photographing Ospreys as well as other birds in flight. Craig was part of an organizing group at Mass Audubon’s Wellfleet Bay Wildlife Sanctuary that recently launched the Osprey Network of Cape Cod. Click here to see a growing collection of his Osprey images. Click here to learn more about Rob Bierregaard’s Osprey banding efforts on Cape Cod and Martha’s Vineyard. Click here for Craig’s blog entries for Wellfleet Bay Natural History Notes. Thanks to Simon Perkins at Mass Audubon, Craig was invited to be part of a boat trip to Stellwagen Bank for the final release of a very rare Yellow-nosed Albatross in June of 2007. The trip provided a unique setting for many photographs of this rare species. As a result of this excursion, Craig was invited to share his Albatross images for two informative articles. These photos have appeared in Birding World, published in the U.K. and one of Europe's premier monthly birding magazines as well as Bird Observer, a bi-monthly birding journal published in the Boston area. Craig is most interested in bird flight and action photography. 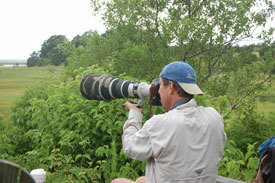 Working with other experienced bird photographers, Craig is constantly improving his techniques using hand held intermediate and large telephoto lenses. Craig is a member of many local and national birding groups. He is a contributing photographer for the Mass Audubon Society, the 300 Committee Land Trust, Salt Pond Areas Bird Sanctuaries, Oyster Pond Environmental Trust, and Birds of North America, an online project for the Cornell Lab of Ornithology. Craig also serves as a current trustee and past president of the Quissett Harbor Preservation Trust in Falmouth, MA. where his photos appear weekly in the region section of the Falmouth Enterprise newspaper. This site provides a range of sample photos taken over the past three years. Like many individuals that are developing new areas of interest, Craig is tackling many challenges: bird identification and behavior, camera techniques especially for flight shots, proper exposure and lighting conditions, as well as effective field work to capture and present the most pleasing images for your enjoyment.